Posted by Jon in Conventions, Masters of the Universe, MOTUC, SDCC 2012 with 0 comments. Well Matty, as they seem to do every year let something out the bag early with an ill timed website update. It was up for roughly ten minutes, but we are watching their site all day long so someone was able to catch and screen cap it. I will not spoil it here on the front page but go ahead and click in here if you really want to see it. Go on, giving you one more chance to back out. After almost one year and over 1,300 entries, we have a winner of our Masters of the Universe® Create a Character Contest! During the Mattypalooza fan panel at SDCC it was revealed that “Castle Grayskullman,” created by Daniel Benedict, was chosen as the top entry and will be made into an actual figure available this fall as part of the 30th Anniversary line. 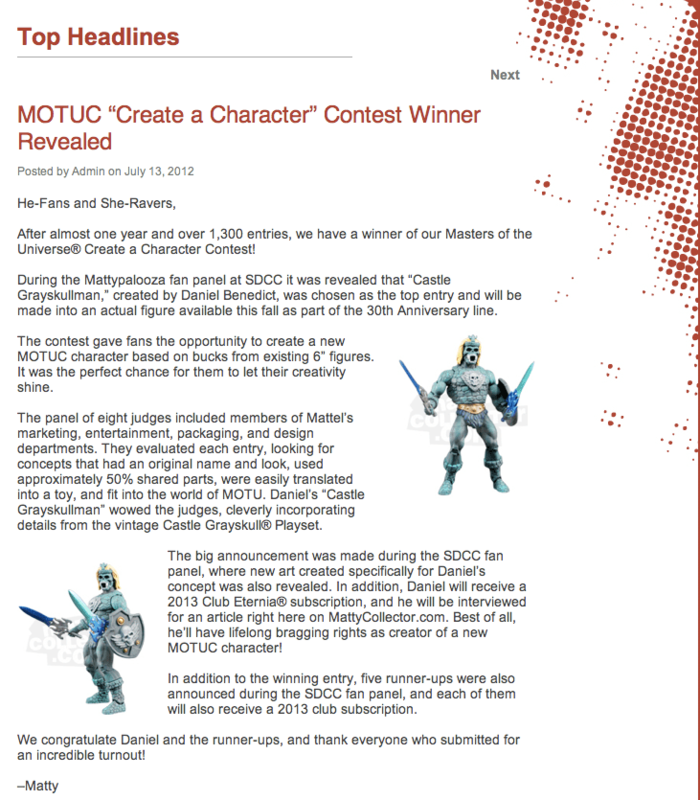 The contest gave fans the opportunity to create a new MOTUC character based on bucks from existing 6” figures. It was the perfect chance for them to let their creativity shine. The panel of eight judges included members of Mattel’s marketing, entertainment, packaging, and design departments. They evaluated each entry, looking for concepts that had an original name and look, used approximately 50% shared parts, were easily translated into a toy, and fit into the world of MOTU. Daniel’s “Castle Grayskullman” wowed the judges, cleverly incorporating details from the vintage Castle Grayskull® Playset. The big announcement was made during the SDCC fan panel, where new art created specifically for Daniel’s concept was also revealed. In addition, Daniel will receive a 2013 Club Eternia® subscription, and he will be interviewed for an article right here on MattyCollector.com. Best of all, he’ll have lifelong bragging rights as creator of a new MOTUC character! In addition to the winning entry, five runner-ups were also announced during the SDCC fan panel, and each of them will also receive a 2013 club subscription. We congratulate Daniel and the runner-ups, and thank everyone who submitted for an incredible turnout! He looks great! Congratulations Daniel and now I can’t wait to see Terry’s figure.